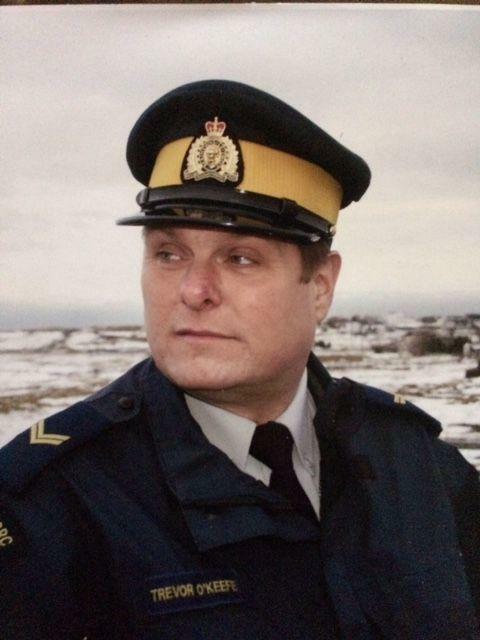 Passed away on September 11, 2017 after a courageous battle with PTSD, our beloved son, Corporal Trevor O'Keefe, RCMP. Leaving with precious memories are his parents Biddy and Pierre O'Keefe, his children Liam and Melissa, his fiancée Roberta White, his sister Tracy and her husband Craig Follett, niece and nephew Clare and Ryan, as well as aunts, uncles, and cousins from the O'Keefe and Dunphy families. Also left with cherished memories are his colleagues at the RCMP and many close friends, including Greg Williams, Karen Dobbin and their three boys. Trevor was a person whose energy and sense of humour brought joy to countless friends and colleagues. We promise to find solace in one another and carry on his dedication to the spirit of community. Visitation at Ryan's Funeral Home, Bay Bulls, Thursday, September 14th from 2-9 pm. Memorial service, Friday September 15th at 2 pm from Sts. Peter and Paul RC Church, Bay Bulls. Inurnment to follow at Sacred Heart RC Cemetery, Tors Cove. Donations in Trevor's name gratefully accepted for the Sacred Heart RC Cemetery Fund, Tors Cove.